These bottles were our Friday night delight. We were hoping for a big, rich wine with some old world style and charm, and it brought the goods. This is a great wine choice for someone raised on California or other New World trophy wines who wants to try an Italian red, just a little outside their normal comfort zone. It is immediately likeable, but brings a whole new realm of subtlety and complexity. Serenelli makes wines in the Rosso Conero wine appellation in the central part of the Marche region of Italy just south of Ancona on the slopes of Monte Conero. Marche itself, lies due east of Tuscany, sandwiched between Umbria and the Adriatic, with Marche’s eastern border being the coastline. The red wine with the DOC designation, has at least 85% of the juice coming from the Montepulciano grape. Sangiovese is often added to the blends, and to a much lesser degree, Merlot. 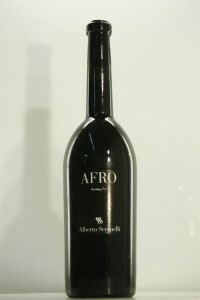 The Afro shows how complex and concentrated Montepulciano from this region can be when it is carefully cultivated. The Afro’s bouquet offers beautiful notes of cherry liqueur, mixed with an intriguing note of earth, saddle leather and tar. There is a little hint of an “animal” quality to the wine, but it is a “just right” character that makes it interesting, and not the type of “out there” aromas that appeal only to zealots and not mere mortals. With patience, this big wine opens up and in the mouth shows off red fruits, cedar, raisins and ripe plums. There are noticeable tannins present that add to its weight and substance, and its substantial, velvety mouth-feel. They definitely deliver grip, but the tannins are not mouth drying. We really enjoyed this wine, and it was a huge hit with bassist Ross Valory and keyboardist Jonathan Cain, who both regularly enjoy Barolo, Ripasso and Amarone. Fortunately, we had a lot of this wine to pour!